A variable wavelength UV detector is available as an optional component for the EcoSEC GPC System. 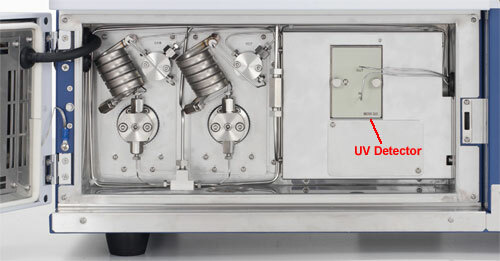 One of the main applications of the UV detector is copolymer analysis. The detector wavelength is variable from 195 to 350 nm and the detector flow path and electronics are optimized for the use of semi-micro columns. The volume of the flow cell is reduced to 2 µL, while the shortest time constant is 0.5 seconds.